I made Double Bean Burgers for dinner last night. Instead of having the burgers again on a bun for lunch I crumbled the patties and put them on some greens and added other veggies. This salad is very filling, which is a big plus in my book. I was excited to make this salad because I got to use greens that I have grown in my aero garden. Since, I do not have an area for a garden and I kind of have a black thumb this is perfect for me. My next goal is to try container gardening. We will see. Note: The measurements are not precise. For example, I used handfuls of greens, not cups. It really depends on your appetite. 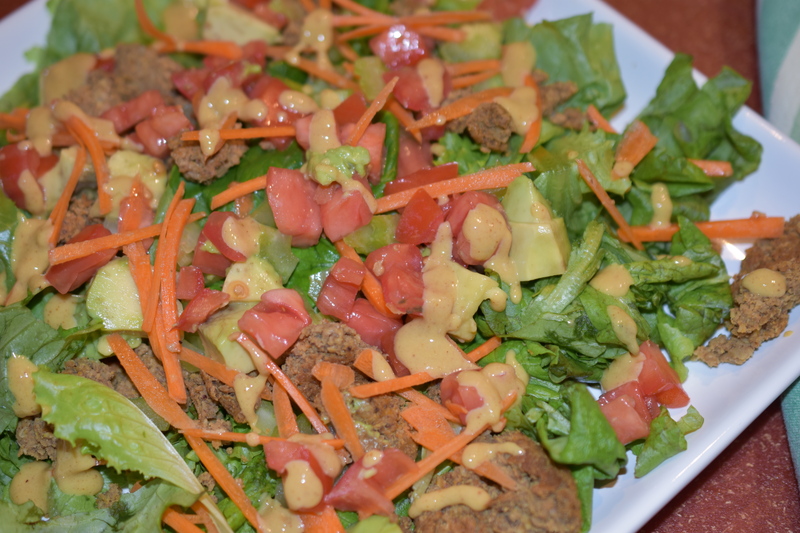 Assemble ingredients and top with 5 Ingredient Dressing.